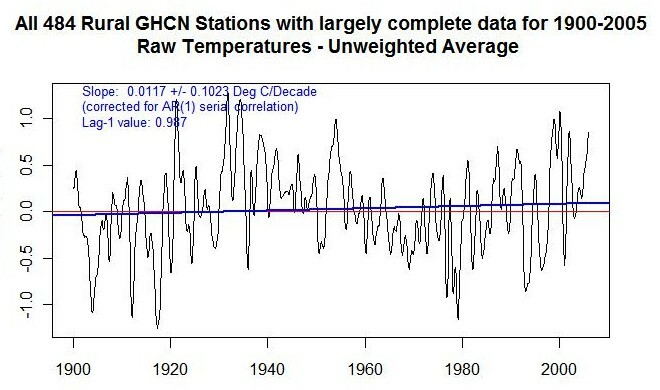 I have written extensible in this blog about temperature measurements, raw and “adjusted” data, the tweaking and discrepancy that is going on, the cherry picking of stations, the urban heat effect etc. from the official temperature keepers. Below is some very intresting analysis of long record GHCN stations data by Nic L.
At Jeff’s request, I present here some findings from work I have carried out using long-record GHCN stations. I have defined these as stations with temperature data in both 1900 and 1999 and fewer than 240 months (20%) in that period with no data. 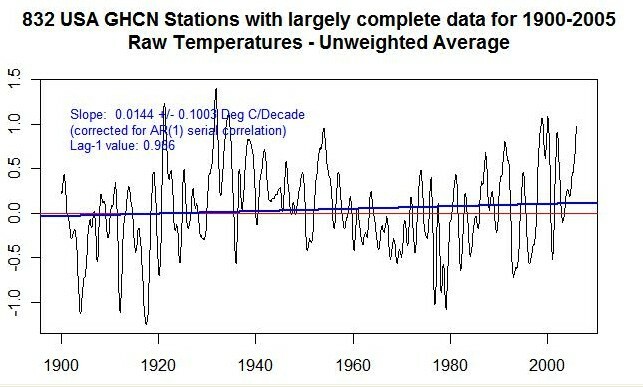 The reason for looking at long record stations is primarily that one can have some confidence that trends over the last 100 years or so reflect actual changes in recorded temperature and are not affected by changes over time in the set of stations that are combined to produce an average. The GHCN database contains temperature records from 7280 separate stations; 4495 of these are WMO stations and the remainder are non-WMO stations, whose station number includes the WMO number of the closest WMO station but also a non-zero modifier to distinguish them from that WMO station. 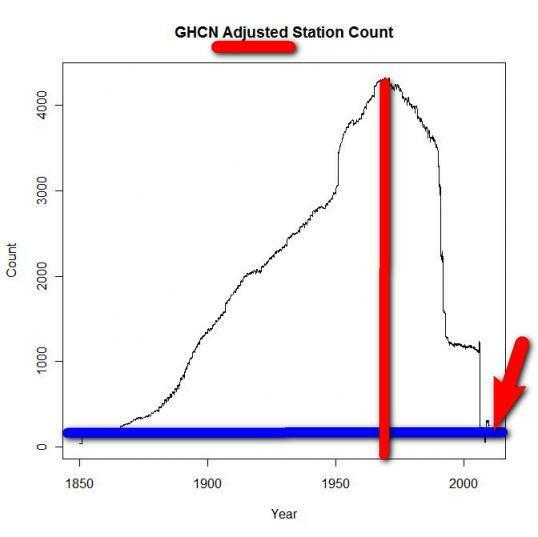 Although the geographical coverage of the 7280 GHCN stations is impressive, unfortunately many of them have short records, with only a minority having data before 1950 or after 1990, and fewer still having data before 1900. 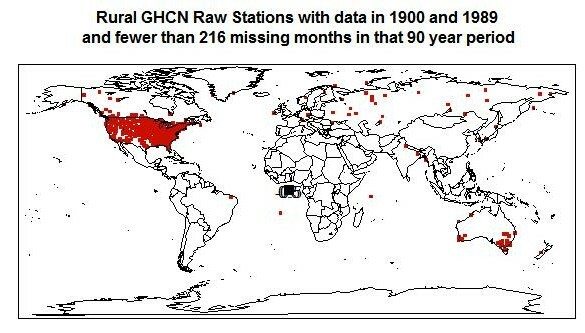 The map below shows the location of the 1034 GHCN stations (not all of which are WMO stations) that meet my long record criteria in respect of their raw data. It can be seen that the long record station set is dominated by the USA, but that there are a fair number of stations elsewhere with 100 year raw data records, with quite a wide geographical spread. 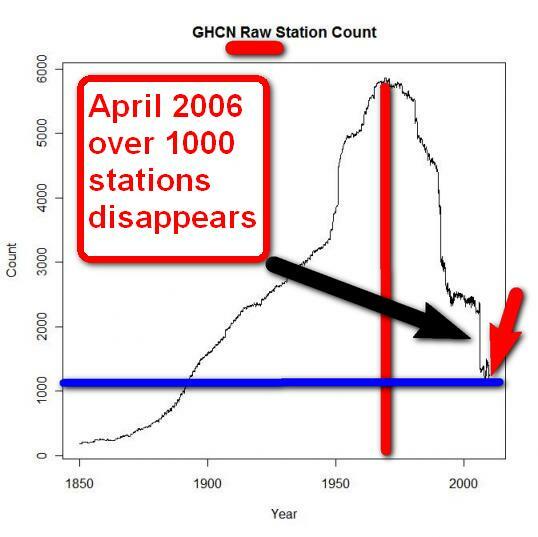 The variation over time in the total number of stations with raw data at GHCN is shown below. Most of the long record stations have data for some years after 1999, but the number of stations reporting data collapsed by over 1000 in April 2006, when many Indian stations ceased reporting, following a previous sharp fall in the early 1990s. 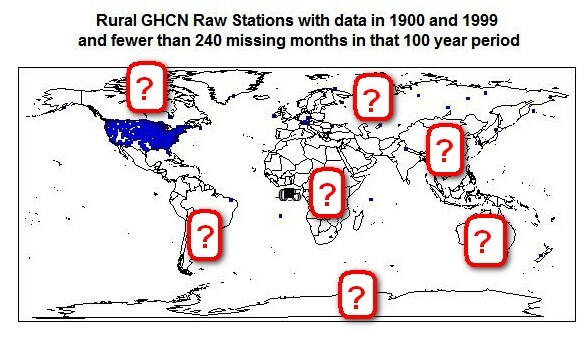 So what story does the raw data from the 1034 long record GHCN stations tell? Shown below is the unweighted mean of the temperature anomalies for all data from those stations for each month from 1999 to 2005. The mean is slightly smoothed, hence the high Lag-1 serial correlation. The trend is fairly low, at 0.0269 Deg. C /Decade – which are the units I hereafter use for all trends. The confidence interval is over three times as high as the trend, which is accordingly far from being statistically significant. There is no pronounced peak in 1998, and the peak temperature occurred in the 1930s. As this data set largely represents temperatures in the USA, that is perhaps unsurprising. For many of the long record stations, GHCN also presents homogeneity-adjusted temperature series, of which there may again be duplicates. Where there are duplicate series, the GHCN files do not indicate which of the duplicated raw series each adjusted series is based on, although often it will be possible to work this out. Peterson’s 1997 Bulletin of the AMS paper “An overview of the Global Historical Climatology Network Temperature Database, available at the GHCN website, gives a very useful summary of the adjustment process, as well as of many other aspects of the GHCN temp data. However, the adjustments appear to be primarily, if not exclusively, aimed at correcting for discontinuities. So far as I can tell, they would not correct for gradual distortions to data caused by, for instance, an increasing Urban Heat Island effect as a conurbation encroached on a previously rural station or the size of a town in which a station was located grew. In order to get a clearer picture of the effects of the adjustment process, I calculated the trend in the combined raw data from all 764 stations which had long records of adjusted data, thereby ensuring a like-for-like comparison. The mean raw temperature anomaly record of those 764 stations is shown below. 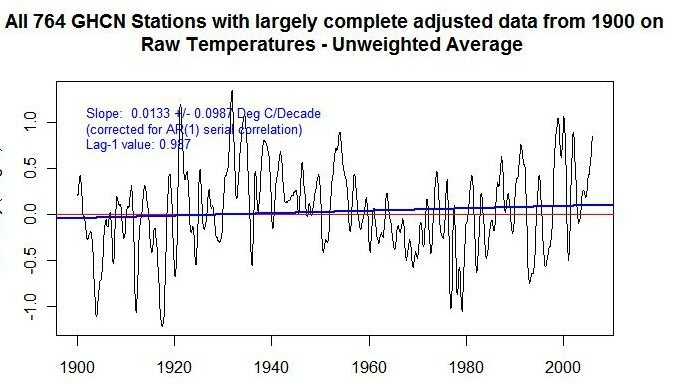 What this shows is that on average the adjustment process more than quadrupled the trend in raw temperatures, increasing the trend of the mean from 0.0113 for raw data to 0.0536. 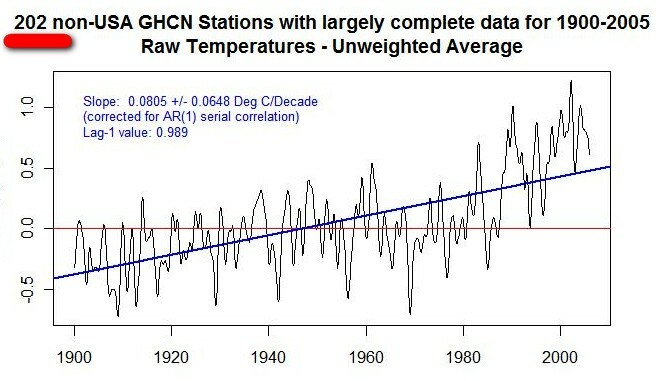 Indeed, if the mean trend change of 0.0423 resulting from adjustments to the long record stations were typical of the effect of adjustments to station data generally, the adjustment process would account for a substantial proportion of the recorded global mean temperature increase over the twentieth century. In an attempt to avoid possible inflation in station trends resulting from UHI effects, I also screened out from the 1034 GHCN stations with long raw data records all but stations marked as rural. That left 484 rural stations, of which unfortunately only 28 were outside the USA, located as per the below map. 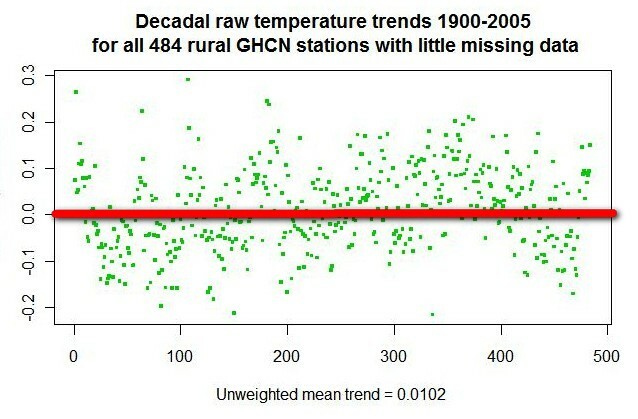 The graph below shows that the mean 1900-2005 trend in the anomaly temperature raw data from the 484 rural stations was 0.0117, statistically completely insignificant. The mean of the trends of the individual series, as shown in the scatter plot below the temperature graph, is almost identical at 0.0102. These trends are under half those for all 1034 stations with long raw data records. Finally, I thought it worthwhile to divide the 1034 long record stations between USA stations (of which there are 832) and the 202 non-USA stations. 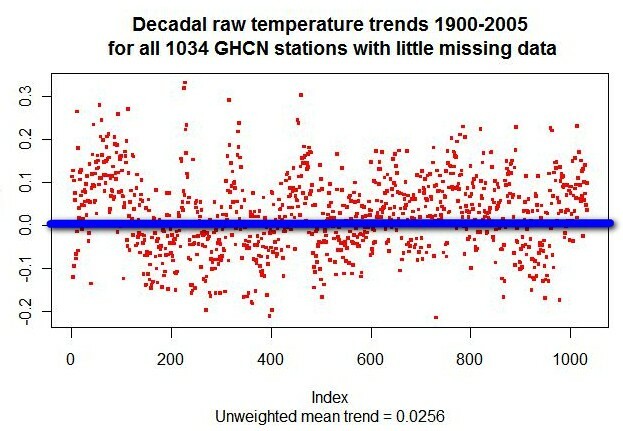 The mean temperature anomaly of the USA stations, and the1900-2005 trend thereof (being 0.0144), is shown in the next graph. By comparison, the mean temperature anomaly of the non-USA stations has a much higher 1900-2005 trend, of 0.0805, as shown in the below graph. This is the only one of the graphs that shows a statistically significant trend. 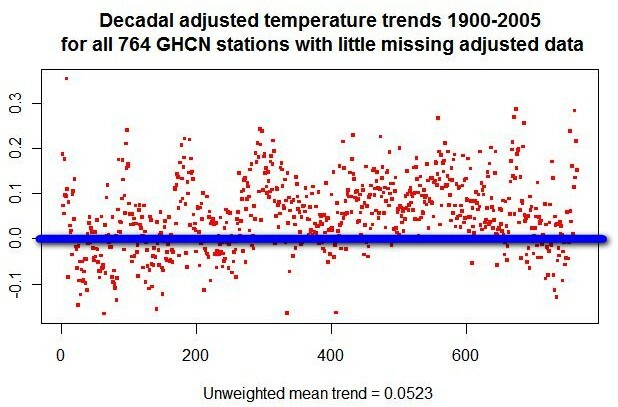 Why should the non-USA long record stations show a mean 1900-2005 decadal trend of 0.0805 whilst the USA ones show a mean trend of only 0.0144? Perhaps the USA has warmed by far less than other areas. But as the non-USA stations are also very largely northern hemisphere, with in many cases similar latitudes to those of USA stations, it is not obvious to me why that should be. However, there is one obvious possible explanation that is worth investigating further here: the UHI effect. A majority, 456 out of 832, of the long record USA stations are classified as rural. Any many of the remainder may be in cities that had by 1900 already reached the size (relatively small, I believe) by which most of the UHI effect occurs. By contrast, only 28 of the 202 long record non-USA stations are classified as rural, and it may be that relatively more of the urban stations are in towns that only became sizeable post 1900. Could the bulk of the difference in trend (amounting to 0.7 deg. 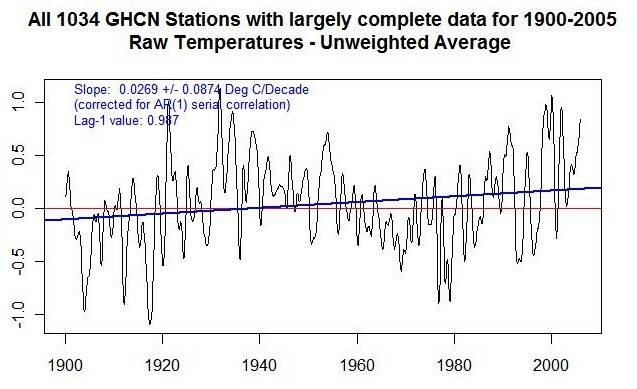 C over 1900-2005) between the long record USA and non-USA stations could be due to the UHI effect? At first sight, It seems conceivable. Having said that, the pattern of temperature movements over 1900-2005 is not the same for the USA and non-USA stations, and there is so much weather noise in the data (even when taking averages of hundreds of stations) that it is difficult to draw any firm conclusions. In an attempt to estimate how much of the difference between the trends of long record USA and non-USA stations might be due to the UHI effect, I shortened the qualifying period to 1900-1990. Doing so increased the total number of rural stations from 484 to 574. More importantly, it increased the number of non-USA rural stations from 28 to 86, albeit these are rather dominated by Australia, Canada and Siberia, as shown on the below map (the final graphic, you will be pleased to know J). I took the mean of the individual station trends over 1900-1995 rather than the trend of the mean, as the anomalisation period is more variable with only a 90 year qualifying period. For the USA stations, the mean trend was -0.0024 (yes, a negative trend, albeit a completely insignificant one). By comparison, the mean 1900-1995 trend of the 86 non-USA rural stations with 90+ year records was 0.0548. The mean trend over the same period for the 297 non-USA non-rural stations was only modestly higher than this, at 0.0606, although the geographical distribution of the rural and non-rural non-USA data sets is different. These results suggest that the UHI effect may account for part of the difference between twentieth century mean recorded temperature trends in the USA and elsewhere, but not the bulk of it. However, these rural station results may not be representative of the rest of the world, and are almost certainly not statistically significant. Further, non-USA stations marked as rural may be more likely to be affected by non-climatic warming, or warming affected by their type of environment, than are rural stations in the USA. For instance, only 12% of USA rural stations are near the coast, next to a large lake or on a small island, whereas 41% of non-USA rural stations are. It is conceivable that such environments could be are associated with greater (or lesser) twentieth century warming than land bound ones, although I am not aware of any evidence to that effect. In conclusion, the raw data from long record GHCN stations shows little apparent warming in the USA and moderate warming (on land) elsewhere, only part of which seems likely to be due to the UHI effect. The adjusted data shows much higher trends than the raw data for the same stations, and it is not clear why the homogeneity adjustments should on balance be significantly positive. This entry was posted on 24 januari, 2010 at 12:19 f m and is filed under Fri- och rättigheter, Miljö - Environment, USA, Yttrandefrihet. You can follow any responses to this entry through the RSS 2.0 feed. You can leave a response, or trackback from your own site.